Present state: Demolished - no evidence remains. 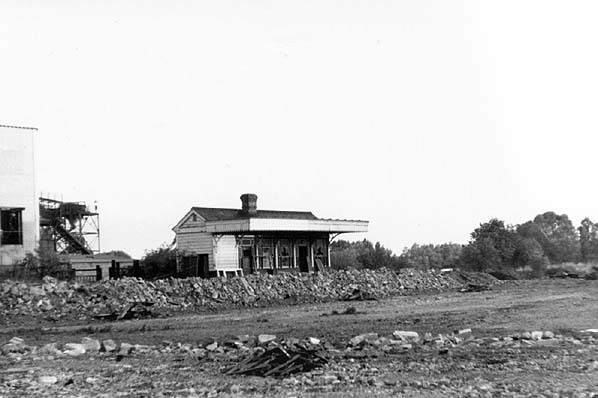 An industrial premises now stands on the station site. Notes: The station was opened as Thrapston with Bridge Street being added from 14th July 1924.
parliamentary assent to construct a line from Blisworth in Northamptonshire to Peterborough. 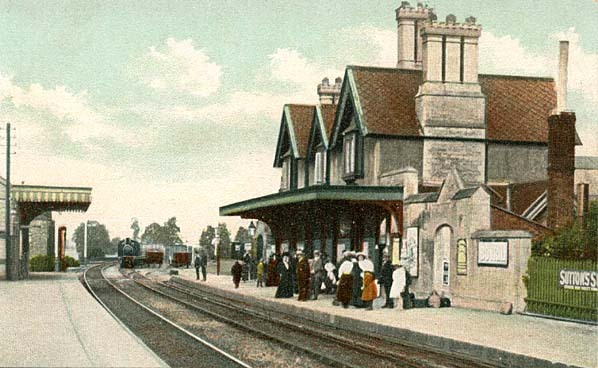 Twelve stations were built in an old English or Tudor style: the names on opening (some changed later) were Northampton, Castle Ashby, Wellingborough, Ditchford, Higham Ferrers (later renamed Irthlingborough), Ringstead, Thrapston, Thorpe, Barnwell, Oundle, Wansford and Overton. The line shared the Peterborough terminus with the Eastern Counties Railway in return for 'running powers' over the line to Northampton, giving it access to the Midlands and the North. The Northampton to Blisworth section was officially opened on Tuesday 13 May 1845 and the complete track was opened on Monday 2 June 1845. On 16 July 1846 the London and North Western Railway was formed by merging the L & B R with a number of other companies and during the mid 1800's, the development of iron ore mining in the area was reactivated having been suspended for 200 years by law due to the lack of wood for charcoal. All available wood being required for the Navy. 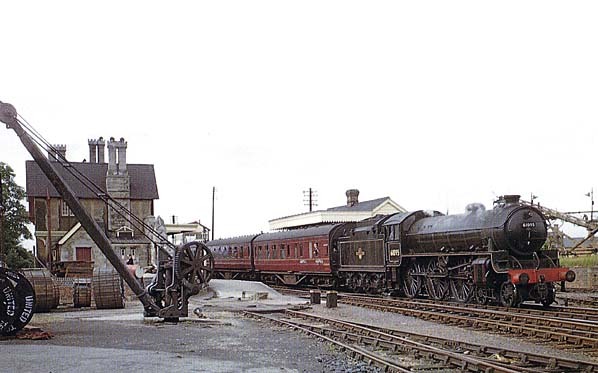 The Great Northern Railway opened a line from Stamford to a junction with the Nene Valley line just east of Wansford on 9th August 1867 and Wansford became a major junction when the LNWR opened their new line from Yarwell Junction (just west of Wansford) to Seaton on 1st November 1879. The 1923 grouping took the line into the London Midland and Scottish Railway (LMS). During the first half of the 20th century the line formed an important connection from Norwich, Cambridge and eastern England to Northampton and the Midlands. The line was generally acknowledged to be a secondary mainline and regularly saw heavy through traffic but operating costs were high with a large number of manned level crossings. Peterborough East was announced. 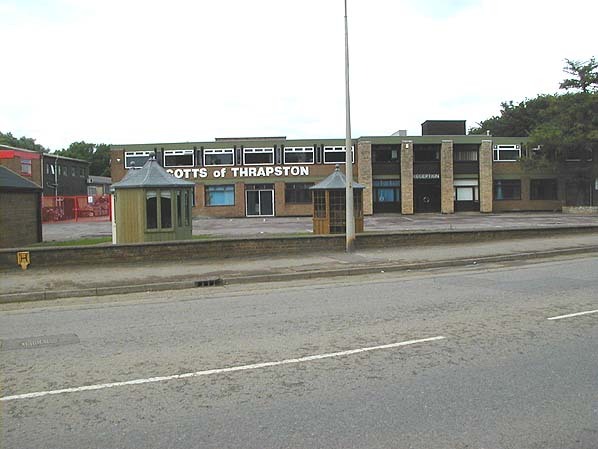 Despite a vigorous campaign against closure culminating in a public meeting at Thrapston, little could be done. A petition was started and action committee appointed but when the committee asked for a collection to meet their expenses only £1 18s 3d was raised! The line was formally closed on Monday 4 May 1964. Iron Ore trains continued to use the line until 1966 with through freight traffic finally being withdrawn by British Rail in 1972. In 1986 the line was eastwards to a new terminus at Peterborough Nene Valley just short of the East Coast Main Line making a total running length of 7.5 miles and a new station is currently under construction at Yarwell Junction at the western end of the line. There are also proposals for a link with the ECML which would allow trains to run into Peterborough Station. Tickets from Michael Stewart. Bradshaw from Nick Catford. Route map drawn by Alan Young. 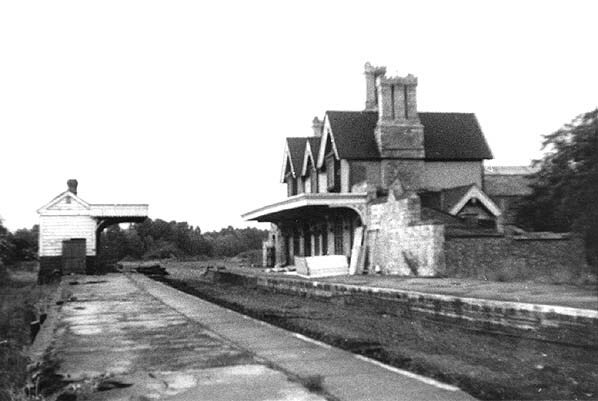 Thrapston Bridge Street station lookin north in June 1966.